It seems strange that it was just February that the Milwaukee Makerspace was finally settling into their new space and I stopped by to shoot a few photos. About two months after that they had their open house and now just two months after that we worked with Make: Live as part of the Hakerspace Roadshow. 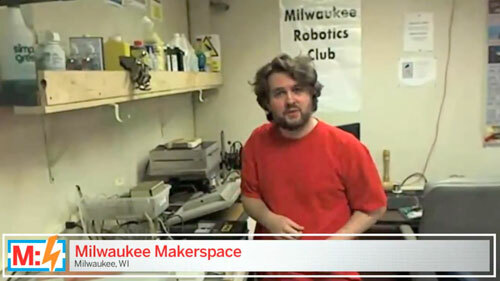 I ended up talking with Matt from Make: Live about my Photo Booth project, and he pitched the idea of including the Milwaukee Makerspace in Make: Live’s Hakerspace Roadshow. The guys were more than happy to be a part of it, so we took it from there. I did the camerawork, via the Logitech C910 connected to my MacBook and we did a test Skype call with Tim from The DHMN before Make: Live called us. The quality suffers a bit from the whole process, but it is a live show. It was challenging, but I think it turned out well. Walking around with the MacBook, looking at the screen while the camera pointed outward was not easy. The image was flipped since Skype expects the camera to be facing you, not away from you. I don’t know if there’s some trick/hack for reversing the screen, but it would come in handy. If you haven’t seen the video yet, check it out. It was also great to see the other spaces, Twin Cities Maker, i3Detroit, and Noisebridge. It was inspiring to see all the other space, and fun to work with Make: Live. I hope we can collaborate again in the future! Posted on Friday, June 10th, 2011 at 12:48 pm. Subscribe to the comments feed. Both comments and pings are currently closed. Post on your own blog.